expect from a band playing the unusual compositions of Raymond Scott. pieces, filled with many of San Francisco's most swinging musicians. soundtracks from "Looney Tunes" that first turned them on to music. That's why these compositions easily fit into a jazz repertoire. That's why this band sounds like Bugs Bunny meets Sun Ra. packed together waiting for the baton of Jeff Sanford. Bruce and Groucho Marx. When you bump into him at a club he'll say, "
This music takes me back..tha good ole dayz..great for music collectors...& great for movie scores. From just the title alone, it’s clear that this live album is filled with goofy, comical and inseparably cartoonish numbers. 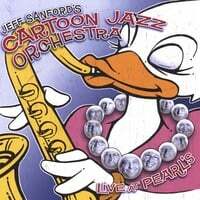 Featuring the music which composer, Raymond Scott, made in the late 1930s, this 13-piece swinging jazz band takes playful liberties with these soundtracks from Looney Tunes, the Simpson’s, The Ren and Stimpy show, The Animanicacs and Roger Rabbit. Cleverly adapted to sound like standard jazz repertoire and highlighting some of San Francisco’s top musicians, Live at Pearl’s will undoubtedly conjure flashbacks of classic chase scenes, standoffs between Bugs and Elmer and an ever-stubborn Daffy Duck. For those of us who grew up on these cartoons, this is not only a collector’s item but one that will take you back to your childhood in style.